Brought to you by the creators of the .17 HMR cartridge, these rimfire rounds are a great choice for rural pest control. 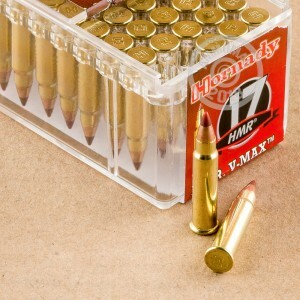 This ammo comes in boxes of 50 and fires a light 17 grain Hornady V-MAX polymer tipped hollow point designed to provide rapid fragmentation and ensure quick kills against varmints. The light bullet produces a muzzle velocity of 2,550 feet per second, greatly enhancing the round's expansion potential. Hornady ammunition has been loaded in Grand Island, Nebraska since the 1940s. Buying in bulk? Save at AmmoMan.com with free shipping on all orders over $99. I was hesitant to try the .17 HMR round but after researching the round and also the rifle (Browning T-Bolt) I made the plunge and the visit to the range this weekend rested any apprehension I had. Sighted in on the 50 yard range I went to the 100 yard range and I was hitting the bullseye with the very first shot. Trajectory is flat and true and on the spot. Scratch the .22 long I'm switching to the .17 HMR. This Hornady ammo is up to the job. Great stuff! This ammo packs a respectable punch. You'll love it. Buy some and shoot an apple, you'll see. GREAT SERVICE WILL BUY AGAIN!!!!!!!!!!!!!!! I honestly believe that there is no better cartridge for mid-range (under 200yrds) varmint destruction. It's got the flattest trajectory, most accuracy, and best terminal performance of any rimfire (well except the .17 mag that just came out hehehe). 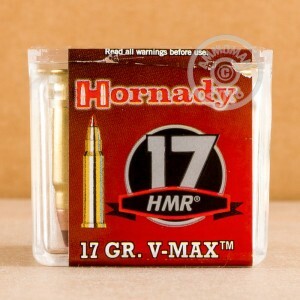 These Hornady .17 HMRs are the best you can get period. In the right rifle they'll drive tacks all day, and they thwack varmits like a sledge hammer. The only bad thing about these really light 17grn bullets is the lack of wind resistance as velocity is lost, and they are easily deflected by grass and such.